TCHO, with a background in technology, is a chocolate maker that takes a scientific approach to everything it does. Founded in 2005 by chocolate industry veteran Karl Bittong and tech entrepreneur Timothy Childs, TCHO engrains technology into every step of its value chain. TCHO has developed a program named ‘TCHO Source’ which was initiated to addresses the gaps in cacao farmers’ understandings, be it in quality, fermentation, flavour. TCHO partners with cacao farmers, cooperatives, and cocoa research institutes around the globe, with the goal to produce the best cacao beans possible. TCHO Source helps supply the tools and training needed, so its partners have the ability to become experts at both flavour analysis and cacao production, while earning a better living. TCHO Source is made up of 3 key components: flavour labs (introduced at origin), improved infrastructure, and sensory analysis (also introduced at origin). When it came the time to create a mint chocolate bar, TCHO took the same process developed by NASA to make ice cream for astronauts, and adapted it to chocolate-making. 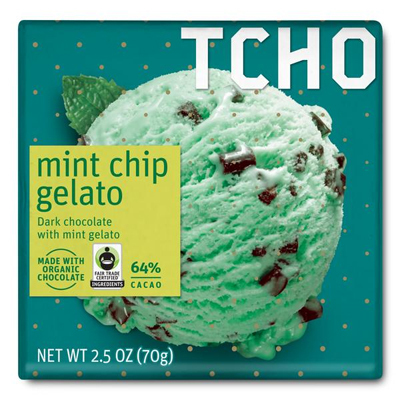 Working with TCHO’s local partners-in-flavour, Gelateria Naia, TCHO freeze-dried Gelateria Naia’s custom mint gelato into crunchy chunks and plunged them into a rich 64% dark chocolate blend. The result is a four-time-award-winning intergalactic flavour: mint chip nuggets that deliver crisp, cool, refreshing minty taste in a dark chocolate bar that is out of this world.